said he advised the FG to sell some assets because he is “a true Nigerian who really wants the issues about the economy to be sorted out." We all know that the exchange rate of almost N500 to the dollar is not a true reflection of the value of the currency – the naira cannot be almost N500 to the dollar! But you see, if this thing is not handled properly, it can get out of hand. . It can get to N600 or N700 to the dollar. But the issue is, why did I suggest that we should sell some of the assets? I know the touchy one is the NLNG. I want to make it categorically clear that even if the government is selling NLNG on credit, I am not interested in buying. It is not a business that I want to invest in. It is a mature business; that is what people don’t understand. You see, we should have invested heavily in all these Brass LNG, Olokola LNG, etc, when former President Olusegun Obasanjo started work on the projects, but we missed the opportunity. Today, you have massive LNG projects that have been done by Qatar, Australia and the U.S is also exporting. But right now, all the gas that we have is even in the ground. Even Mozambique has a massive amount of gas and also Tanzania, and they are nearer to the markets than we are. So, if somebody is even going to invest in LNG, he would go to those areas and invest there and not here in Nigeria." 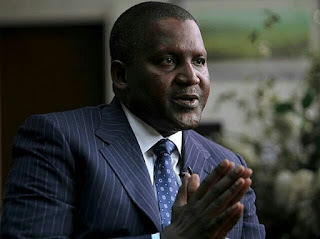 Dangote maintained that Nigeria requires about $15bn to jumpstart its economy, saying that if the amount were added to Nigeria’s foreign exchange reserves of about $25bn, this would help attract foreign investors. He said: “I can assure you that if our forex reserves get to $40bn, you will be shocked at how people will reject even buying dollars. So, is it worth it for us to keep assets that we are not using?